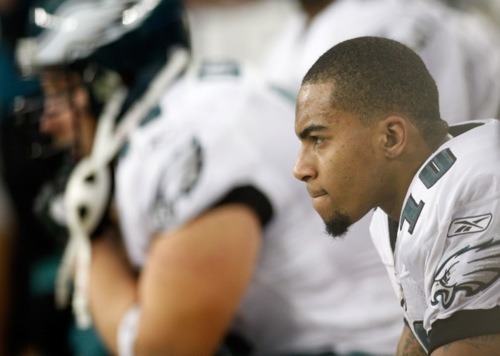 A constant trope has emerged among fans and writers, debating the relative merits of DeSean Jackson. On one side are the folks who marvel at Jackson’s speed and explosiveness, who see the way he changes the dynamics of the game with his special ability to score from anywhere on the field. On the other side are the doubters, people who see a diminutive, injury-prone and inconsistent player who’s too unreliable to be a true #1 wide receiver. Often, statistics can help to settle questions like this. On this topic, however, the stats are split. DeSean’s proponents can sight his ridiculous 22.5 yards per reception figure and rattle off the dozens of big plays he’s been a part of over the last three years. On the other hand, Jackson’s league-leading drops percentage isn’t winning over many skeptics. Even the “advanced” statistics are split. Check out the following graph comparing two wide receiver stats for 2010: Football Outsiders’s DYAR and Advanced NFL Stats’s EPA. As you can see, there’s a strong correlation between the two stats among wide receivers with 50 or more targets last year. That’s encouraging — it means the two numbers often agree on player performance. But look at DeSean, way off the trendline. Expected Points Added puts Jackson among the top ten wide receivers in the NFL. But Defense-adjusted Yards Above Replacement says he’s worse than average among the 85 most-targeted receivers. 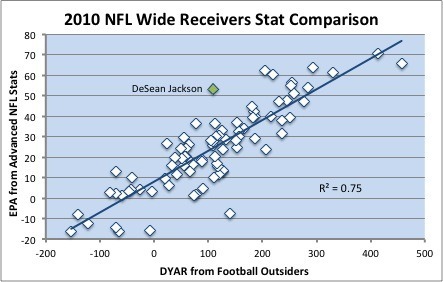 In fact, the difference between DeSean’s rank in EPA and DYAR is the greatest among all these receivers (barring only Terrell Owens, floating down in the bottom center of the graph). DeSean is involved in a lot of plays that lead to expected point gains, but aren’t counted as highly by Football Outsiders’ statistics. I’m not really sure what causes this difference, and I’m open to suggestions. But, either way, it suggests that this debate probably isn’t going away any time soon. Some people will count one stat and some will look at another, and come to opposite conclusions. Tagged with Philadelphia Eagles, DeSean Jackson, Wide Receivers, Statistics, Graphs, Football Outsiders, DYAR, Advanced NFL Stats, EPA, Targets, Drops. May 30, 2011 by Brian Solomon.